Enliven comes with seven featured widgets to showcase your content in a clean and organized way. 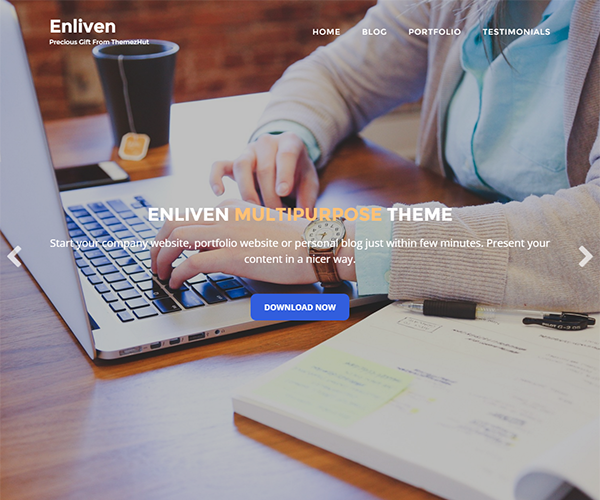 Enliven is featured with Jetpack’s Portfolio and Testimonial custom content types to categorize and display your portfolio and testimonials separately within your site. 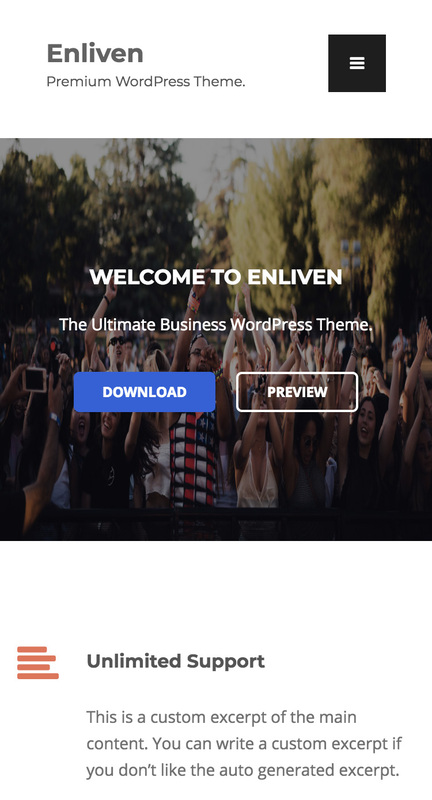 Enliven has a builtin full screen slider with capability to create a title, a description and two buttons along with each slide. Added flush rewrite rules for CPTs. Fixed some issues in mobile navigation. Fixed some issues slider style. Added logo image upload option. Fixed empty appearance issue in blog archive page. Fixed some widget style issues. Corrected all the wrong usage of get_theme_mod with empty(). Removed enliven_posts_nav() function and used the_posts_navigation(). Removed enliven_post_navigation() function and used the_post_navigation(). Added 'enliven' prefix for all the post thumbnail sizes. Added 'is_jetpack_cpt_active' active callback for customizer jetpack portfolio and testimonial sections. Used esc_url to escape image url in the content-hero.php file. Changed css/js enqueue handle names to standard handle names. Used wp_script_add_data() to check useragent. Changed enliven_admin_scripts() to enqueue admin css/js files only for widget page. Portfolio and Testimonial widgets wrapped with "if ( class_exists( 'Jetpack' ) && Jetpack::is_module_active( 'custom-content-types' ) )"
Removed content creation sections for slider. Used pages instead. Removed content creation areas and used pages instead of them in Enliven: Icon Block Widget and Enliven: Call to Action widget. Fixed a translation issue in Featured Pages Widget. Removed images folder as it is no longer needed. Fixed some issues in Enliven: Clients widget. Added enliven_filter_theme_page_templates() function to filter portfolio page template when the jetpack is not active. Added theme-info.php to the theme. Corrected theme links in the theme description. Fixed a small issue in Testimonial image header. Removed footer copyright default text from customizer. Added pagination function enliven_paging_nav for Portfolio page template. Added color control to change the main theme color. Added color controls to change button colors. Added few stylings to customizer.